All I can say is, it has been a while! But this Fox has been very very busy! This past weekend was my last “greatest college weekend ever” Little 500, if you are not sure what it is, Google it. All my friends who graduated last year came into town and we had one incredible weekend. We bar hopped, reminisced, dressed crazy, and sang classic ‘90s tunes obnoxiously loud trying to get strangers to sing along while walking pretty much everywhere in Bloomington. Besides Little 5, I attended a “What’s Next?” seminar that discussed how to find a career after you graduate. It was very helpful and I learned some very valuable tips, like even if you don’t live in the city you are applying in, try and put an address in that city on your resume so it makes you look more accessible. For example, I am applying in the Palm Beach/Ft. Lauderdale area so my permanent address on my resume will be switched to my grandparent’s address, hope they don’t mind! I have also been getting all of my work done the past 3 weeks. I have had a bunch of papers due and tests, one right after the other. But today I can finally relax because it was my last day of classes ever! I just have 1 final a week from Friday and then I am really done! What’s more exciting is next week, May 8th is graduation! I am so thrilled and feel very accomplished, but it really has not sunk in yet. I think when I put on that cap and gown and my family is in Bloomington then it will feel very real. My only dilemma is what am I going to wear under the cap and gown? I would like to wear a patterned dress and my new clog inspired Jeffrey Campbell wedges (those shoes are a whole other story) but I am afraid when I look back on my pictures I will look straight out of the 70s, but that kind of is the trend today. So I am somewhat on a hunt for a graduation dress that will go with the clogs but I am not going to look too hard, I do have some dresses I could wear. But it’s my college graduation I think that deserves a new dress! So I haven't had time for a new post, don't worry there will be one eventually. Maybe this week? But I decided it was time for a new layout! Hope you fellow fashionistas like it! Just realized I have not posted for a month! No worries my fellow fashionistas, a couple posts to come this week! After a busy day of class, errands, and meetings that started at 7:30 AM and ended at 9:00 PM I decided to relax by watching The September Issue. I have been waiting and waiting for this movie to come out and today it was finally released on DVD. 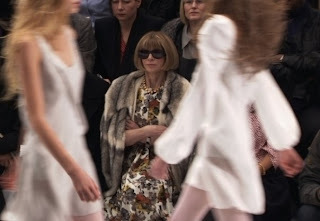 The September Issue is about American Vogue and features its notorious head editor Anna Wintour. If the fashion industry was Indiana University Apparel Merchandising department Anna would be the director of the department (if you are reading this and you’re an apparel student at IU, you know exactly who I am talking about). She is the only opinion that matters and the most influential decision maker. Her choices not only affect the designer world, but they will also affect the mass market when the trends she picks to feature in the magazine trickle down into retailers like Target. The September Issue provides a behind the scenes look at what goes into making one of issues of the magazine. 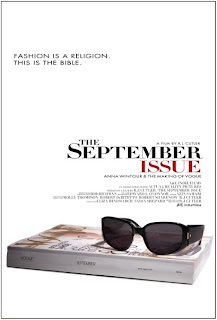 They are creating the September issue, hence the title, which is the most important issue of the entire year. It is also the biggest and the September 2007 issue that they are working on had a record breaking 840 pages, which 727 were ads. Anna is of course the star of the film but it also shows Creative Director Grace Coddington who creates incredibly gorgeous pictures. I also loved how we got to see Anna’s more personal life and see some happy emotions from the usually firm editor. Nobody likes you when 23....What's my age again? It has been a while since I posted and a lot has been going on! 2 weeks ago it was my birthday! The big 2-3! It was a blast! And this year my birthday was on a Friday so I could go all out! 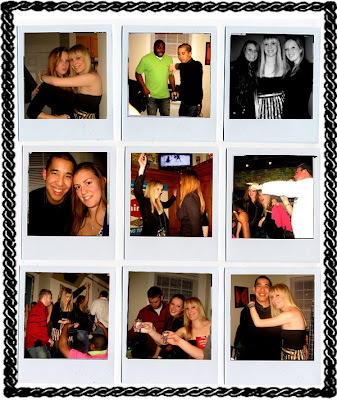 I had a very fun soiree at my house with amazing friends and great music. My new favorite song “Say aah” by Trey Songz and *NSYNC was on heavy rotation. I even made appetizers – spinach and artichoke stuffed mushrooms, apple and goat cheese Bruschetta, and polish roses which is a pickle covered in cream cheese wrapped in corned beef (sounds horrible but they are so good, I got the recipe from a friend who made them for a super bowl party)! After the party we all trekked to some Bloomington bars, Brothers and Sports, 2 of my favorites. And since it was my birthday I of course had to get a fab new outfit! I wore a new dress which I purchased from the most amazing website, asos.com, which is a UK online fashion mecca with extremely reasonably priced merchandise. The only downside is they have a problem with timely shipping and tracking packages and you have to pay a currency exchange fee. Anyway, my dress was so cute! It was a strapless dress with a slight sweetheart neckline that had a solid black torso and a striped black and white striped skirt with a gold chain pattern. It also had pockets, a great feature. I also wore black tights because it felt like the Arctic Circle outside and a black knit motorcycle jacket. I accessorized with these great black suede platform pumps from Aldo and Juicy Couture gold multi chain bracelet that I already had. My parents got me a beautiful birthday present that I also used – a new Rebecca Minkoff handbag that is black with gold zippers, it is a cross body bag that is very flat, perfect for a night on the town. I also wore my bangs, which I really like now, just took a month and a half to get used to them. My birthday was probably the best one I have ever had and was filled with fun and great friends! My mom told me “isn’t it the worst feeling the day after your birthday because you have to wait a whole year for the next one”. Yes, it is, especially after the incredible one this year but I can’t wait to see what the next one will hold. I am pretty willing to try all trends. I didn’t think I would like boyfriend jeans, but I bought a pair and instantly loved them. There is one trend that I have noticed in just about every apparel store that I am not behind and do not think I will ever wear unless it is very subtle. And that trend is military inspired clothing. It is now in every store and every design that I have had a huge problem of finding a simple black jacket. I do like how structured the designs of military inspired clothing are, still I just can’t seem to like the buttons and over all aesthetics of the trend. Military inspired clothing has always been a timeless trend. Lately it has been taken to a whole new level. I also think that it has become so prominent lately for one reason and one reason only. Michael Jackson. After his death instantly we were seeing this look. I understand that he changed music and was a huge inspiration to people, including my favorite musicians, around the world. One of his signature peices was elaborate military jackets. Now, every time I see a military inspired jacket I immediately think of him. I also realize people truly adore him and never want to forget him. However, it was his style and I think it should be left for us to remember in pictures, not for the apparel industry to figure out a way to make some more money and not for us to copy his unique well established style. It was Michael Jackson’s look, not the world’s, and let’s respect him by remembering the look not saturating it into the apparel market. I am a senior at Indiana University Bloomington. I have a major passion for fashion. When I graduate I hope to get my foot in the door of the fashion industry, and after a while become a fashion tour de force!